DAK Americas, an international resin producer in the Alpek Polyester Business group of companies, announced last week it will purchase the Perpetual recycling plant. The 100,000-square-foot plant takes in recycled PET bottles and processes the material into a washed flake, which is used as manufacturing feedstock. RPET produced at the Perpetual facility is used in multiple applications, including food-contact, non-food-grade and industrial-grade flake, according to the facility’s website. The Perpetual facility produces 100 million pounds per year of RPET flake, according to DAK. To produce that material, the plant consumes about 160 million pounds of recycled PET bottles per year. DAK’s announcement comes shortly after prime resin producer Indorama announced its purchase of plastics recycling company Custom Polymers PET, and it comes as more virgin resin producers globally are investing in recycling operations and technologies. 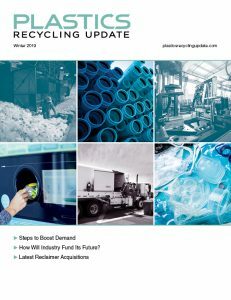 In an interview with Plastics Recycling Update, DAK spokesman Ricky Lane explained the factors contributing to the pending purchase. Last year, Lane Said, DAK saw more and more consumer interest in sustainable products, in turn translating to brand owners looking to meet that demand by increasing their recycled plastic usage. The brand owner buying needs are key to DAK’s acquisition. “This is just reinforcing our position and our ability to supply that demand,” Lane explained. DAK began its recycling industry involvement in 2009, when the company entered a joint venture with carpet manufacturer Shaw Industries. The joint venture resulted in Clear Path Recycling, a Fayetteville, N.C. recycling plant supplying both DAK and Shaw with recycled PET. DAK also owns Ecopek, an Argentina-based PET recycling facility processing about 35 million pounds of recycled PET bottles per year. Between all its recycling operations including the Perpetual plant, DAK has a capacity to produce 115 kilotons of RPET per year, or about 254 million pounds, Lane said. DAK has signed an asset purchase agreement for the Perpetual site and the company aims to close the sale near the end of the month, Lane said. As for whether DAK will further its involvement in recycled plastic production in the future, that’s dependent on whether the market for the material grows. “We would be looking to balance supply and demand,” Lane said. In addition to its recycling investment, DAK parent company Alpek is involved in a joint venture effort to acquire the stalled M&G virgin PET production facility in Corpus Christi, Texas.